In addition to a full-service spa, The Sukhothai Bangkok features an outdoor pool and a spa tub. Dining is available at one of the hotel's 3 restaurants, and guests can grab a coffee at the coffee shop/café. The property also has a nearby snack bar/deli. Guests can unwind with a drink at one of the hotel's bars, which include A poolside bar and A bar/lounge. A computer station is located on-site and wireless Internet access is complimentary. Event facilities measuring 13622 square feet (1266 square metres) include conference centres. This luxury hotel also offers a fitness centre, spa services and tour or ticket assistance. For a surcharge, a round-trip airport shuttle (available 24 hours) is offered to guests. Complimentary self-parking and valet parking are available on-site. The Sukhothai Bangkok is a smoke-free property. Located in Bangkok City Centre, this luxury hotel is within a 10-minute walk of Embassy of Germany and Lumpini Park. Patpong Night Market and BNH Hospital are also within 1 mile (2 km). Lumphini Station is 6 minutes by foot and Si Lom Station is 14 minutes. This smoke-free hotel features 3 restaurants, a full-service spa and an outdoor pool. Free WiFi in public areas and free valet parking are also provided. Additionally, a fitness centre, a bar/lounge and a poolside bar are on-site. All 210 rooms boast deep soaking bathtubs, and offer WiFi and 24-hour room service. Wired Internet (surcharge) and fridges are standard, as are LED TVs with satellite channels. 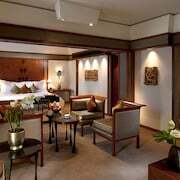 The Sukhothai Bangkok offers 210 forms of air-conditioned accommodation with minibars and espresso makers. A pillow menu is available. 40-inch LED televisions come with premium satellite channels and pay-per-view films. Fridges and coffee/tea makers are provided. Bathrooms include a separate bath and shower with a deep soaking bath and a rainfall showerhead. Bathrooms are also outfitted with a complimentary bathrobe, complimentary slippers and designer toiletries. This Bangkok hotel provides wired and wireless Internet access for a surcharge. Business-friendly amenities include desks, complimentary newspapers and telephones. Additionally, rooms include a safe and complimentary bottles of water. A nightly turndown service is provided and housekeeping is offered on a daily basis. Amenities available on request include in-room massages. Celadon – This restaurant specialises in Thai cuisine and serves lunch and dinner. Reservations are required. Colonnade – This restaurant specialises in international cuisine and serves breakfast, brunch and lunch. Reservations are required. Zuk Bar – Overlooking the garden, this bar only serves light fare. La Scala - Opening Soon – This restaurant specialises in Italian cuisine. Spa Botanica has 7 treatment rooms, including rooms for couples. Services include facials, body wraps, body scrubs and body treatments. The spa is equipped with a sauna and a spa tub. A variety of treatment therapies are provided, including aromatherapy and Ayurvedic. Rollaway/extra beds are available for THB 2354 per night. The Sukhothai Bangkok is listed in the 2010 Condé Nast Traveller Top 100 List.